Town of Belkofski as seen from cemetery. Holy Resurrection Church is center right, the tallest building in the picture. 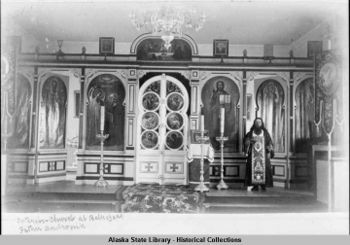 Holy Resurrection Church in Belkofski (also Belkofsky, Belkovski, or Belkovsky), Alaska was a historic church of the Russian Orthodox Mission to Alaska. As with many Alaskan towns, the population of Belkofski was never great, and as the town's fortunes waned, the population left, leaving Belkofski a ghost town by the 1980s. Holy Resurrection Church was added to the National Register of Historic Places in 1980, but this was not enough to save the church, and the structure collapsed in 1992. In 2013, a fire destroyed all the remaining structures of Belkofski - including the remains of Holy Resurrection Church - except the school building. Belkofski, Alaska was founded as an outpost by Russian traders who sought to make money harvesting sea otters. Many of the residents were Aleuts who were hired and relocated here in order to do this. By the 1880s, Belkofski - despite its very remote location on the eastern side near the tip of the Alaskan Peninsula - boasted three stores and supply shipments from San Francisco. One church report from 1879 indicates that 650 Orthodox souls resided there, though this may have included its associated "chapel" churches, which were in small, remote villages that a priest would only occasionally visit. 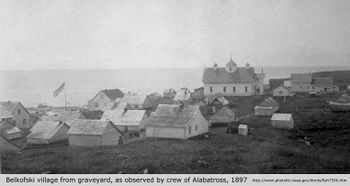 There is indication that there was a church constructed in Belkofski earlier, perhaps around 1843, but the newspaper The Alaskan out of Sitka indicates that the building that stood for most of Belkofski's history was constructed in 1887. The church itself was somewhat unique, being one of the few of that era and history that did not have an onion dome on it, but instead had three pyramidal cupolas. The design, instead, hearkened back to the Church of the Resurrection, dating from 1732, at Kolomenskoie, on the Moskva River, near Moscow, Russia. Unfortunately for Belkofski, the sea otter trade dried up, and by the 1970s, it was just a tiny village in an extremely remote location. The church was added to the National Register of Historic Places, but after the last residents left Belkofski in the 1980s, the upkeep of Holy Resurrection became impossible. St. Herman Church in King Cove was established in 1984, and in many was has become the successor church to Holy Resurrection. Knowing that Holy Resurrection in Belkofski could not be saved, in 1987, the iconostasis was removed and brought to St. Herman Church in King Cove. In 1992, the church structure of Holy Resurrection collapsed. However, much of what had been in the church was brought to other churches, including the church bells - which had been cast in San Francisco in the 1880s - and icons. In 2013, the entire site of the town of Belkofski was destroyed by fire, save for the building that served as the school and teacher residence. In 2015, St. Herman Church in King Cove secured a $24,000 grant from the Rasmuson Foundation to build a bell tower on their church so that the bells from Holy Resurrection church may be rehung. This page was last edited on June 30, 2016, at 20:22.